The fantasy fiction genre is fun for young readers. They can immerse themselves in its vivid worlds, where magic takes center stage, animals and plants assume human qualities, and wizards and witches possess power for good or for evil. This season, Enslow Publishers offers ways for tweens and young adults to enjoy reading and writing in this genre. Our new fantasy fiction trilogy -- a first for Enslow -- provides a rich tapestry of episodes, characters, and atmosphere which readers can imaginatively explore at their leisure. The Brightworking Saga: Book I of The Brightstone Saga, the lead title in author Paul B. Thompson's trilogy, introduces the series's age-peer heroes, their encounters with magic, and their adventures in new, colorful worlds. The 160-page book is available in a hardcover trade edition for $17.95. Meanwhile, Enslow's new Write Fantasy Fiction in 5 Steps offers young patrons who love to write, or for library outreach programs focusing on writing, another way to explore the fantasy genre. Author Laura Lee McKay's accessible 48-page work shows aspiring writers how to craft an exciting fantasy. The book, part of Enslow's "Creative Writing in 5 Simple Steps" series, is available in library editions for $17.95. That price represents a 25% discount from Enslow's list price for this book. On this date in 1935, in the United Kingdom, paperback editions of ten reprinted titles were printed by Penguin Books. Having taken the innovations of Albatross Books, a company which actually produced the first paperback in 1931, but because of World War II, Albatross was not able to fully carry out its ideas. Today, even with the emergence of e-books, paperback books are still popular. Which bindings do you buy to read? Enslow's latest fiction series, A Champion Sports Story, is available in paperback. This 5-book series is great for those students interested in sports who want a fictional twist. And with the Olympics taking place this week, the soccer books are timely! The Summer Olympics are finally here! Looking forward to watching the opening ceremonies? Don't forget to view the Summer Olympic schedule ahead of time so you don't miss any of your favorite events or athletes. Work on a new Jimi Hendrix biopic, or biographical movie, "All Is By My Side" is apparently under way. Although a release date has not been scheduled, there is already a lot of buzz surrounding the film. Jimi Hendrix fans might enjoy reading our biography, "Jimi Hendrix: 'Kiss the Sky'" from our American Rebels series while they wait for the movie to hit theaters. Now that we're into the dog days of summer, librarians face the challenge of providing young readers with fun, engaging books. Options that fit the season include Enslow Publishers' sports fiction titles. These new, 100+-page works provide page-turning reasons for young patrons to feel excited about reading. Each fast-paced book delivers a story about peer-appropriate characters in dramatic situations centered on popular sports, such as baseball, soccer, and football. The high-interest narrative approach also embraces how the characters interact with important values, including sportsmanship, fair play, and teamwork. The books, written by David Aretha, Kris Rutherford, Stuart A.P. Murray, and Benjamin Jarman, are excellent choices for reluctant readers, as well as those with a strong interest in sports. Enslow currently offers five sports fiction titles suitable for readers in Grades 3 through 6. Each title is available in paperback for $9.95. A library-bound edition is also available for $19.95 -- a 25% school/library discount from Enslow's list price! Daniel is currently working on several projects for 2013. In one of those projects, a movie called Kill Your Darlings, is about a murder in 1944 that brings together the great poets of the beat generation.Daniel's character is Allen Ginsberg. William Burroughs' character will be played by Ben Foster, and Jack Huston will portray Jack Kerouac. Happy Birthday to Latina TV and movie star, Selena Gomez who turns 20 today! If you were Selena what would you wish for? Our monthly raffle continues even into the summer! Even though it's July, our monthly raffle is still on. Don't forget to sign up! Use a combination of drawing, dictating, and writing to narrate a single event or several loosely linked events, tell about the events in the order in which they occurred and provide a reaction to what happened. The first chapter of each book in this series includes a true story about a dog and his or her handler. The author tells the story of an event in the order in which it happened. Teachers can read the story aloud to the students pointing out key phrases like, "The next day..." and "before bed." In Fire Dog Heroes, the author includes the handler's reaction to the dog's first accelerant find by praising the dog. "Good girl, Ashly. Very good girl!" After using the story as an example, teachers can then have students choose an event in their lives that they wish to draw and write about. Ideas might include their trip to the beach or bringing home a new pet. They can create something as simple as filling in boxes drawn on a large piece of paper, similar to a comic strip format or something more elaborate like making a book from folded pieces of paper. One thing for sure is kids never seem to lack stories to tell, especially about themselves. They will probably enjoy sharing their illustrated stories with their classmates as well. As part of its fall 2012 program, Enslow now has three graphic novels available. All three of these titles in the Dark Graphic Novels series are written for the middle school reader, and each is 96 pages in length. Chilling Tales of Horror contains seven classic horror short stories: "The Hand" by Guy de Maupassant; "Sir Dominick's Bargain" by Joseph Sheridan Le Fanu; "The House of Nightmare" by Edward Lucas White; "The Vampire" by John William Polidori; "House B on Camden Hill" by Catherine Crowe; "The Body Snatcher" by Robert Louis Stevenson; and "The Black Cat" by Edgar Allan Poe. Dark Graphic Tales by Edgar Allan Poe includes three of Poe's short stories: embark on a treasure hunt in "The Gold Bug"; visit an insane asylum in "The System of Doctor Tarr and Professor Fether"; and face psychological terror in "The Fall of the House of Usher." The third title in the Dark Graphic Novels series is Frankenstein by Mary Shelley. Reanimated by author Siergio A. Sierra and illustrator Meritxell Ribas, this classic tale of a young Victor Frankenstein who vows to discover the secrets of life and death. He assembles a monster from parts of corpses and brings it to life with the use of electricity. All of these titles are available directly from Enslow or through your vendor. That was the day Apollo 11, carrying Neil Armstrong, Buzz Aldrin, and Michael Collins blasted off from the Kennedy Space Center in Florida. This mission landed the first Americans on the moon, with Neil Armstrong taking his first steps on the moon on July 20. It was this moment that the famous quote "One small step for [a] man, one giant leap for mankind" was heard by people worldwide, as the event was broadcast live on television. Walking on the Moon, part of the American Space Missions—Astronauts, Exploration, and Discovery series, gives students an understanding of how this first mission took place and how it started a mission of space exploration that would last for decades. Written for reluctant readers, this six book series also includes The Coolest Job in the Universe, Danger in Space, Eye on the Universe, Space Shuttle Disaster, and Spacewalk. Rogers Waters brings his new production of the "The Wall" which he recently performed at Yankee Stadium. The tour runs through July 21. At 68 years old, Mr. Waters uses updated themes from the 1979 Pink Floyd album with current events in this musical production. Bass guitarist and vocalist George Roger Waters was born on September 6, 1943, in Great Bookham, England. He was the youngest of two sons born to Eric Fletcher Waters and his wife, Mary Waters. Eric Fletcher Waters was a member of the British air force fighting in World War II. Just a few months after Roger was born, his father was killed in action in the battle of Anzio, Italy. Mary Waters was a piano teacher. One of her students was Syd Barrett, who became friends with Roger. Roger reportedly had unhappy experiences at school. He would later call on those experiences to write the lyrics for what would become some of the most memorable Pink Floyd songs. As a teenager, Roger took an interest in music. Yet after graduation from Cambridge High School for Boys, he enrolled at Regent Street Polytechnic School in London in 1962 to study architecture. Waters rented a house from an architecture professor. Barrett, his childhood buddy, was in London studying art. They become roommates for a while. Waters soon grew more interested in music than in architecture, and he often jammed with Barrett and other friends. Waters taught himself bass guitar since Barrett was a better guitarist. After Barret left Pink Floyd, Waters became the band's main lyricist. His sources of inspiration included the friend he lost to drugs and mental illness, and the heroic father he never knew. For more about Rogers Waters and the band, Pink Floyd, check our book Pink Floyd: The Rock Band, an unauthorized biography from our Rebels of Rock series. A FREE Educator Guide can be download. This book is available in library binding and paperback. Check it out today! Do you know or have students who want to write fiction? Creative Writing in 5 Simple Steps is a series of six titles, each of which discusses a different type of fiction. Each of these 48-page titles, written for upper elementary and middle school students, encourages writers to create their own type of fictional work. In Write a Graphic Novel in 5 Simple Steps, shows young, aspiring writers learn how to create new universes of their own through the unique combination of words and pictures that make a graphic novel. Author Amy Dunkleberger shows aspiring writers how to invent a believable mystery in Write a Mystery in 5 Simple Steps. Anyone who wants to write romance will discover five simple steps showing them how to do so in this title. Written by Suzanne Lieurance, useful tips, exercises, and referrals show readers how to create tales of epic romance. Fantasy fiction is a great genre for those who enjoy stories about wizards and witches, time travel, talking animals, and fairies. Laura Lee McKay demonstrates how to create fantasy fiction using five easy steps. Horror stories succeed if they strike terror in the reader. Author Laura Baskes Litwin describes the five steps used to get that fantasy fiction story written. Michael A. Schuman shows aspiring writers how to write science fiction. Robots, clones, computer technology, cyborgs, life under the ocean or on other worlds are all examples of this popular work of fiction. All of the above titles are available as library bound books. Or so I thought. Then I started looking into it. Doctor Daniel Hale Williams, an African-American physician, repaired a wound to the pericardium (the sac surrounding the heart), but did not operate on the heart itself. It also appears that this was not the first time this type of operation was done. Approximately two years earlier, another physician by the name of Henry Dalton performed a nearly identical procedure. Vivien Thomas, subject of an Enslow Elementary title, was not a physician, but worked with Alfred Blalock, including assisting Blalock in an operation on the first blue baby syndrome case in November 1944. The two worked together for many years. Even though Vivien Thomas never received his medical degree, he trained many aspiring surgeons using his efficient surgery techniques. It's not too late to sign your kids up for summer reading programs. In addition to your local library, check for programs around your community. Here are just a few of the dozens of summer reading incentives we've collected to get your kids started on the road to summer reading. What is your favorite summer reading program? Judy Cunningham with the San Diego Public Library! 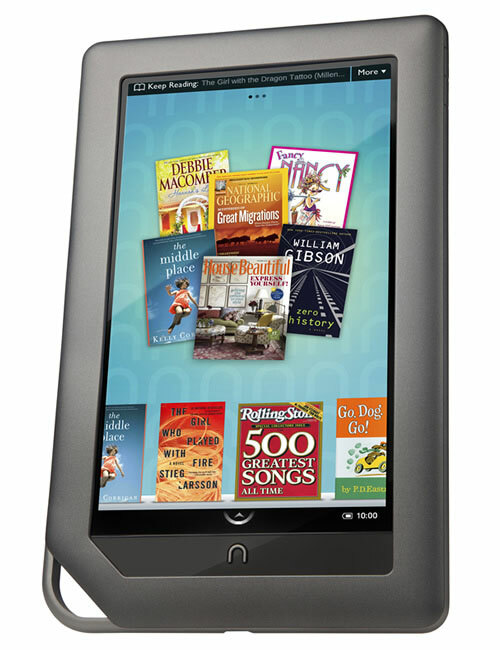 She's the lucky winner of our raffle drawing from ALA for a free Nookcolor. Congratulations Judy! On this day in 1962, in Rogers, Arkansas, Sam Walton opened the first Wal-Mart. Within 20 years, that first store was the first of 551 in 15 states. He had started working at a J. C. Penney store, and became friends with the Butler brothers who owned the chain of stores that went by the Ben Franklin name. He worked for them for a while before wanting to open his own store. Now open in 15 countries, under 55 different names, and 8,500 stores, Walmart has become a brand-name, known for its reasonable merchandise prices. A biography of Sam Walton was written by Sally Lee and is part of Enslow's People to Know Today series. Written for the middle school market, this book is a great read for entrepreneurial students.